In this article, we have shared all 25 questions from general intelligence & reasoning section of SSC CHSL Tier-1 exam conducted on 22 Jan 2017 (Evening Shift) with answers and proper explanations. Question 1 Select the related word/letters/number from the given alternatives. Explanation:- The antonym of ‘Intelligent’ is ‘dumb’. Similarly, the antonyms of ‘inflate’ will be ‘deflate’. Question 2 Select the related word/letters/number from the given alternatives. Explanation:- F S --------- +2/+1 ----> IT. Similar to this, Q T -------+2/+1 -----------> T U. Question 3 Select the related word/letters/number from the given alternatives. HI : 17:: PQ : ? Explanation:- In alphabet series, H stands at 8th position and I at 9th position. The addition of these numbers is 17. Similarly, P stands at 16th and Q at 17th position. The addition of these numbers is 33. Question 4 Select the related word/letters/number from the given alternatives. 4: 1024 :: 7 : ? Question 5 Select the odd word/letters/number/number pair from the given alternatives. Explanation:- Xenon, Argon, and Helium are inert gases excluding hydrogen. Question 6 Select the odd word/letters/number/number pair from the given alternatives. = H -----+9-----Q-------+9 ------ Z. Question 7 Select the odd word/letters/number/number pair from the given alternatives. Explanation:- all of them are consecutive alphabets in reverse order except ABC. Question 8 Select the odd word/letters/number/number pair from the given alternatives. Question 9 A series is given with one term missing. Choose the correct alternative from the given ones that will complete the series. Explanation:- Caterpillar is dependent upon leaf for feeding. Similarly, Snake eats frog. Question 10 A series is given with one term missing. Choose the correct alternative from the given ones that will complete the series. CD, FA, IX, LU, ? Explanation:- Series follows (+2) (-2) rule. Hence, next term will be OR. Question 11 A series is given with one term missing. Choose the correct alternative from the given ones that will complete the series. Explanation:- The given series follows (+3)(+3) rule. Hence, the missing term will be VX. Question 12 A series is given with one term missing. Choose the correct alternative from the given ones that will complete the series. 0, 4, 18, 48, 100, 180, ? First number in the series is increased by 1 and second number is increasing in the multiple of 2. Hence, the missing number will be [(6+1) * (30 +12)]=294. Question 13 In the following question, two statements are given each followed by two conclusions I and II. You have to consider the statements to be true even if they seem to be at variance from commonly known facts. You have to decide which of the given conclusions, if any, follows from the given statements. 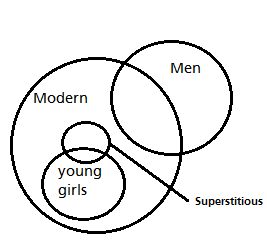 Explanation:- The following diagram states that both given conclusions do not stand true. Question 14 If the age of Rahul is 5 years more than his friend Ajay's age and the age of Rahul's wife is 6 years less than Rahul, and Ajay's wife is 1 year older than Rahul's wife, then which of the following statements is true? (a) Rahul's age and Ajay's wife's age is same. (b) Ajay's wife's age and Ajay's age is same. (c) Rahul and Ajay are of the same age. (d) Rahul and Ajay's age difference is 3 years. Question 15 Arrange the given words in the sequence in which they occur in the dictionary. Forbes > Forensic > Forest > Formation. Question 16 In a certain code language, "STATION" is written as "5313462" and "RED" is written as "789". How is "TRAIN" written in that code language? Hence, T R A I N ----->3 7 1 4 2. Question 17 In the following question, select the missing number from the given series. Explanation:- The sum of all rows comes out to be 47. Question 18 If "S" denotes "multiplied by", "V" denotes "subtracted from", "M" denotes "added to" and "L" denotes "divided by", then 72 L 24 S 3 V 7 M 2 =? Question 19 In the following question, which one set of letters when sequentially placed at the gaps in the given letter series shall complete it? Explanation:- in the above given series, ‘d’ is preceded by ‘b’ , ‘a’ is followed by ‘b’, and ‘b’ is preceded by ‘a’. Question 20 Mohan is chasing a bike which is moving in the southwest direction. In which direction is Mohan moving? Explanation:- It is obvious, if mohan is chasing a person heading to south-west direction, then he will be in the same direction. Question 21 A word is represented by only one set of numbers as given in any one of the alternatives. The sets of numbers given in the alternatives are represented by two classes of alphabets as shown in the given two matrices. The columns and rows of Matrix-I are numbered from 0 to 4 and that of Matrix-II are numbered from 5 to 9. A letter from these matrices can be represented first by its row and next by its column, for example, ‘K’ can be represented by 22, 04, etc., and 'P’ can be represented by 77, 98, etc. Similarly, you have to identify the set for the word 'STRAIN’. Explanation:- We have to determine the code for STRAIN. Compare all the options with these data. Question 22 Abhishek is Byomkesh's brother and Vimal is Jackie's father. Ella is Byomkesh's mother. Abhishek and Jackie are brothers. How is Ella related to Vimal? Explanation:- As questions states that Abhishek & Byomkesh are brothers and Abhishek & Jackie are brothers. Hence, all of them are brothers. It implies that Vimal is father of them. Since, ella is Byomkesh mother. Hence, Ella is wife of Vimal. Question 23 If a mirror is placed on the line MN, then which of the answer figures is the right image of the given figure? Explanation:- in mirror image, object is inverted 180 degrees. Question 24 Identify the diagram that best represents the relationship among the given classes. Explanation:- Ladoo and Jalebi both are sweets. Question 25 A piece of paper is folded and punched as shown in the below question figures. From the given answer figures, indicate how it will appear when opened. Explanation:- It is obvious that if a paper is folded three times, then number of holes will be 2 * (3+1) = 8 holes.